We’ve reached the penultimate chapter of regression to full-on thirteen-year-old, only with my own house and a much higher credit limit. Last time I tracked my geekdom from a manageable low tide to being reignited thanks to a visit to Brave New Worlds comic shop. Get ready – we are about to dive deep into comic book nerdness. 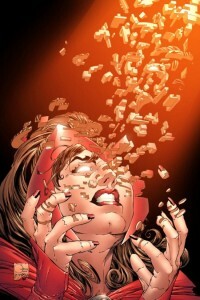 Scarlet Witch losing her tenuous grip on reality - and on her face. I thirstily devoured my newly Civil War trade paperback – loving the more-grounded, less-spandexed take on the comic book world. But where were my X-Men? Unlike the video game Civil War I had just played – complete with Cyclops and Jean Grey – here the X-Men were nowhere to be found. A little internet sleuthing revealed the X-Men were largely holed-up at the mansion during the civil war, recovering from the worldwide reduction of mutants from thousands to a mere 198 thanks to M-Day. M-day was the result of House of M, when an unhinged Scarlet Witch commanded “No More Mutants” after she was forcibly evicted from her pleasant alternate reality where Magneto ruled a mutant-centric Earth. Um, okay? Sure. Meanwhile, Jean Grey was in my video game, so was she back to life? Emma & Jean ... not exactly fast friends. Apparently not – Grant Morrison killed her both Jean and Magneto in 2003 during his run of New X-Men, the same one that cemented Emma Frost as an actual X-Man. Except, now Magneto was an X-Man too and Marvel was hinting at a Phoenix return with their new character Hope Summers – a pint-sized mutant Messiah who was the only new mutant born post-M-day. Hope was an infant then, but was promptly whisked away to the future by Cable to protect her from a murderous Bishop, who was sure she was a sign of coming apocalypse (little “a,” not big “A”), and now she was about to return as a not-so-tiny teen that looks a lot like Ms. Grey. I spent the weekend surfing comic sites, trying to make some sense of the convoluted comic history that occurred since I gave up in 1996. I was about to move into a new house where I could actually have packages delivered, so maybe I’d catch up on a few comic books. Maybe just Uncanny X-Men? From issue #1 to where my collection started, and then to present day. Surely Marvel’s flagship title was entirely collected in trade paperbacks, easy to obtain from my friend Amazon. 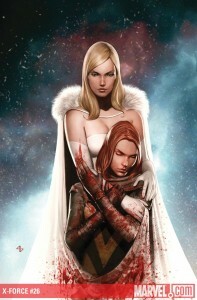 Emma Frost and Hope Summers. Like a car crash, this is so disturbing that I can't seem to look away. And, hey, even if there were some holes to fill with single issues, surely there was some straightforward guide to X-Men trade paperbacks that I could refer to somewhere on the internet. Nowehere. On. The. Entire. Internet. Try to wrap your head around that. The vast expanse of internet replete with its hard-core complement of geeks was devoid of a definitive guide to X-Men trade paperbacks. Oh, I searched. I had forty-seven tabs open in my browser, trying to make sense of a tangle of Essential X-Men and Marvel Masterworks and Omnibuses and Premiere Editions. I found an out-of-date continuity site, the patchwork archive of Uncanny X-Men dot net, litanies of lists on Wikipedia, and a slew of lists on eBay and Amazon. Lots of pieces, but no whole: a single, comprehensive website that tracked every X-Men comic from issue #1 to issue whatever. A guide to collecting X-Men comics as an adult. A logical, sequential explanation of how to catch up in TPBs instead of unwieldy, expensive single issues. It simply didn’t exist. So, of course, I had to build it. And I did – in less than two months! You can check out my guide to collecting X-Men now, but to hear how it came together, and how I came to own ten years worth of X-Men TPBs in a fortieth of the time, you have to tune in to one more installment!